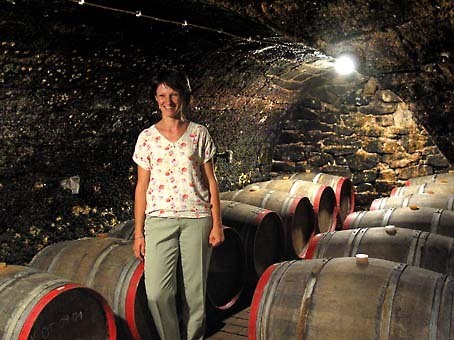 A frenchwoman-oenologist settling down in Hungary, marrying in Hungary and setting up her own winery there, that was a story I could not miss, I thought, when I first met her in Budapest . My visit at Stephanie & Zsolt Berecz's Kikelet ( in Tarcal near Tokaji , in the Tokaji wine region) was another unexpected gift from the Borfalu wine fair in Budapest : In this kind of event, you get the chance to meet people who direct you to other people, who in turn direct you to other people.... That's how I met her and her husband Zsolt, at the Kikelet's stand . And this energetic and positive woman began to tell me her story, with a first glass of one of her whites : a Harslevelu 2004 . 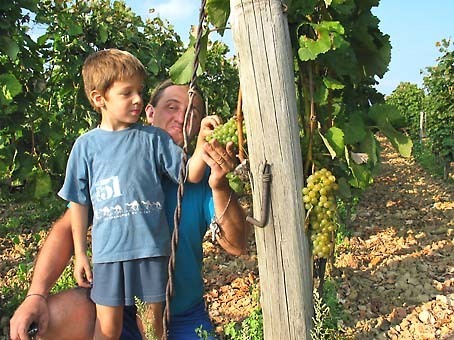 A "Hungarikum" : a hungarian indigenous grape variety, recognizable in the vineyard with its very long clusters [see pic on left , and the one on the right , with young son Thomasz] . My notes say : Mineral notes . Fresh . She says blossoming was overstretched that year, millesime with high acidity . Back to her story : She came in Hungary as a certified oenologist to work at the then-just-resurrectted Disznoko estate, a few kilometers from here . Her job there was of course dealing with the vinification stage, and she only could work on the after-the-press part . Disznoko was a great experience, but she felt she needed to work not only on the vinification, but also have a say about the way the vineyard is managed . This led her to later make the steps to own a winery herself . But let's not go too fast, as in-between she met her future husband at Disznoko, where he was also employed . She worked through 10-11 harvests at Disznoko, then quit . 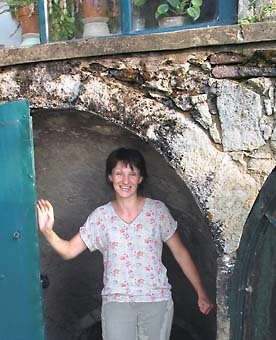 She and her husband had begun gathering vineyard plots in 2002 . But she ultimately took another job as oenologist at Pannon, a 14 hectare Tokaji winery, where she could vinify and look over the vineyard. And with her efforts, she already acquired some visibility through her own wines in Hungary . I had promised to call when I would be in the region, and this happened 10 days later . I first met her husband Zsolt, and he showed me the different plots while Stephanie finished her workday at Pannon . I left my car in the village and he drove me through chaotic dirt and dry-mud tracks uphill to the vineyard-covered slopes hovering over the village . He speaks only hungarian but we still could do some gestures . I was amazed at the all-terrain abilities of his car, an eastgerman-made (DDR) Wartburg . The tracks were awful and the Wartburg , winding and shaking and rearing-up, went over the obstacles just fine . I told him my love for another enduring car : The soviet-era Volga M24 . He visibly agreed [ if a russian millionaire/benefactor reads these lines, I'd love to have one from the 1970's delivered here in Paris...:) ] . We first stopped near a Harslevelu/Furmint plot . Part of the plot (Furmint) is with wide inter-rows (for tractor access), further , the Furmint rows are closer from each other : He planted additional rows in between 3 years ago . 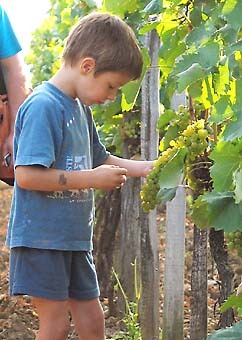 Already makes nice size of clusters [see picture below where he and his son check the grapes]. Further , we look at the Harslevelu's long clusters , and young Thomasz seems to have learned already the skills of tasting the grapes . Checking the Furmint grapesStephanie told me later that her husband has assimilated the techniques for a reasoned work of the vineyard , like plowing between the rows and pruning, which was something new in the context of the viticulture of the former socialist era . And their philosophy has been to choose carefully the different plots that constitute their 2 hectare estate, and at the same time make improvements like planting additional rows . Stephanie Berecz in Kikelet's cellar Stephanie joins us, as her workday at Pannon ends . She arrives in a sleek japanese-made 4WD with Pannon markings on the side . We get out of the Wartburg and step into her pickup, to go see another location uphill, with view over the village on one side, and on an old open-air andesite quarry with a pond where local kids fish and swim . The loess is visible on the rock face of the quarry . Time to go to the house/chai now . It is located in Tarcal . It is an old family house that they share with Zsolt's mother, and which they restore progressively , both for the home part and the chai/cellar part . 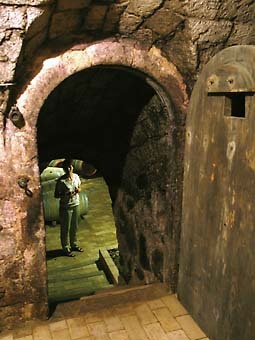 Like many hungarian houses, it has an old and spacious cellar suited for wine making . Restoring the building opens new questions about the original layout of this very old house . They discovered that the cellar was built on-and-around a central pillar holding the whole building . Some walled-up doors can still be seen in the walls and their intitial use is a not-yet-unveiled mystery [see picture below on the left, of the passage between the 1st cellar and the 2nd cellar]. Setting up a winery is quite an investment and these 2 hectares are a good base for now, she says, which allows working along the buildings restoration, the purchase of equipment, and enduring the vinification time, as wines around here require patient elevage before being sold on the market . That all means financial endurance, wich is why also she kept another job . Her goal was also to avoid having to borrow money, debts being often in the way of meticulous wine making . Remember that making Tokaji wines is an even longer term effort than for other types of wines . __1 Kikelet Tokaji Harslevelu 2004 . Dry white . Very clear and limpid wine . Fermented in cask , and raised on its lees . Very difficult millesime, she says . The grapes had difficulty to grow, that year . Blossoming was overstretched to 2,5 weeks instead of 1 week usually, resulting in grapes at very different stages on the same clusters . Some producers around chose to make the malolactic fermentation because of the high acidity . She opted for not doing it . __2 Kikelet Tokaji Furmint 2003 . Dry white . Matured 1 year in cask . Clear and light . Very different as this was a year with very ripe grapes. Very expressive nose . "Gourmand", a delicacy, like the grapes were, Stephanie says . Really a nice wine . 1500 Forints (about 6,6 Euro) . __3 Kikelet Tokaji Furmint 2002 Late Harvest . The first late harvest made at Kikelet . 65 g res/sug , well balanced, with the millesime's acidity . This was a year with a lot of maturity, but fruity and with acidity . 500 ml . 2100 Forints ( 9 euro ) . __4 Kikelet Tokaji Late Harvest 2003 . 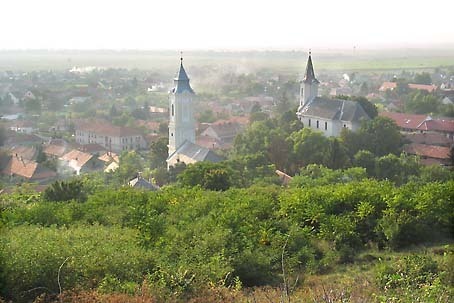 Harslevelu (majority) and Furmint . The bottle was uncorked 2 days ago but improved during these two days , she says . Ripe fruits . Superb . Great pleasure . 65/67 res/sug. 2300 Forints (about 10 Euro ) . __5 Kikelet Tokaji Szamorodni 2003 . Sweet white . From a demijohn , the rest of a bottling, as there has been made only 450 bottles of this wine . Very sweet . Very rich . Substance and concentration . Reached naturally 120 g, then with some Eszencia added to it, it reached 140 g . Will be sold at 7500 Ft ( 33 Euro ) . It has not passed the agreement yet (will be presented in november) .The risk is that the agreement panel considers it like an Aszu wine . I see that the agreement question is a concern also outside France . 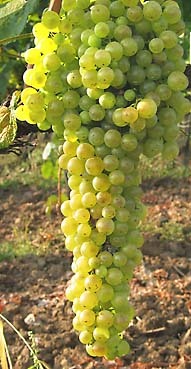 Different grape varieties can be used for these sweet wines, this is not here a central criterion . __6 Kikelet Tokaji Aszu 2002 . Sweet white of course . 400 bottles . Opened also a few days ago , with such low quantities, you don't uncork a bottle for each visitor . She says it lost some of its complexity at the nose . Crystallized lemon . She says in its youth , this wine is a mix of sweet sugary with acidity . She says she employs each year the same female harvesters for picking the Aszu grapes . They understand the strict requirements she asks for the selection of the grapes . They don't bottle themselves at Kikelet and prefer having the job done by well-equipped wineries . At the beginning it was done at the Hetszolo winery ( owned by another french insurance giant : the GMF group ), now it is done at Pannon ( where she works as oenologist ) . __7 Kikelet Tokaji Aszu 2004 5 Puttonyos . Freshness in the nose . Mango . Yellow plum . Lemon aromas . Ginger, she adds . Will assert itself in the next two years . She uses 2-3 year old casks . She also bought wood from the Zempleni mountains, had it dry 3 years to have a local cooper ( who incidently was the one who sold them the first vineyard plot for Kikelet ) make 3 new casks of it . She will use these casks soon . __8 Kikelet TokajiAszu 2003 6 Puttonyos . Will be bottled in january 2006 . Golden colour with green reflections . Fresh nose . Great coating in the mouth . Exceptional millesime around here . The summer was warm, but not as hot as in western Europe and France . Crystallized greengage aromas . It is already dark when I leave Stephanie and Zsolt . This was a great visit . office : Nagy Balazs u. 50 . Cellar : Konyves Kalman u. 62. Also : Tel : 36-30/636-90-46. Great article !! I will try to visit them during my next trip to the beautiful region of Tokaj ! !